The ICFF and Sterling Surfaces, What an Incredible Week! We just completed an incredible week at the ICFF show held in New York City May 15-18 2010. Just walking the show floor was a living demonstration of how Solid Surface is becoming a designers dream. You name it and the designers were using Solid Surface; for sinks, furniture, picnic benches, thermoformed walls and more. We were happy to help out with some of our partners as well with their show floor exhibits plus after hours functions. For this event we worked with LG Hausys and Starwood Hotels design team to help young design student Ben Fullerton from the University of Wisconsin Stout create his design the .ari chair. 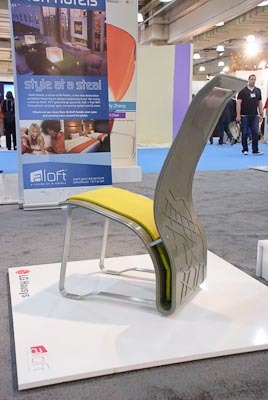 Sterling Surfaces contributed the engineering, CNC machining, thermoforming and sanding to make the chair come to life. It was a blast! Please enjoy our video documenting the fabrication process. Sunday night, New York City at the Milk Studios Penthouse, overlooking the Hudson River with a stunning sunset, and a lively crowd. Wow what a night! Sterling Surfaces fabricated the DJ booth complete with LED lights pulsing away in sync with the music. Using Opal from the Lucent series, illuminated by multicolor LED light strands, the DJ booth was a hit at the party. We also worked closely with the Starwood’s design team to create beautiful displays out of LG Hausys Spectrum Orange to highlight each of the 3 Student Design winners. The look was stunning. The team at Starwood showed why they are so good at what they do! AFNY is a premier plumbing supply company based in New York City. 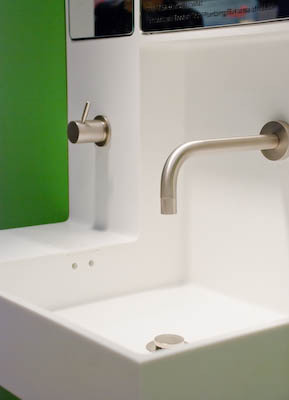 AfNY has contracted with Sterling Surfaces to be the supplier for their new Kathy Chia designed Recessed Sink and Cabinet out of Corian Glacier White. What a great surprise to learn that since we made the prototype, this model has won several design awards. Truly a testament Kathy Chia’s design expertise and AFNY’s discriminating taste in product selection. Overall, an outstanding week for Sterling Surfaces, working with clients and forming new relationships.